Versjon 2.0.0 av Ringo Standalone Client er nå tilgjengelig. Denne krever at du har en relativt ny versjon av Java 8 installert. Versjonen 2.0.0 av Ringo Standalone Client støtter sending og mottak av EHF 3.0 formater og den krever en oppdatert Java versjon for å støtte nytt HTTPS sertifikat med TLS 1.2 sikkerhet. Unit4 Access Point standalone client enables you to download and upload PEPPOL invoices to our access point in minutes. Configure your ERP system to import invoices from the configured inbox-folder and export to your outbox-folder. Click here to download Unit4 Access Point standalone client and Save as. 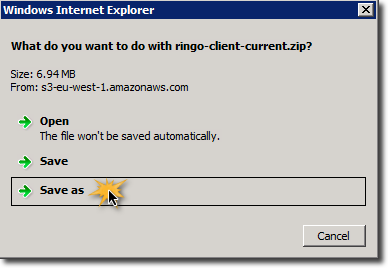 Extract the downloaded file to somewhere easy to access, like C:\ringo-client. Do not use "space" in the folder name. Create 3 folders named "inbox", "outbox" and "archive" somewhere easy to access. Do not use "space" in any of the folder names. Download PEPPOL invoices to your server - (incoming invoices from your suppliers). All downloaded EHF invoices will now be saved in C:\inbox and you have to configure your ERP system to import EHF invoices from this folder. Just use EHF for channel. All EHF invoices that were found in your outbox folder, will be moved to the archive folder after they has been uploaded. If an error occurs during the transfer, the EHF invoice will be left in the outbox folder together with an error file describing the problem. If you want to run upload or download automatically every night, you could use Windows Task Scheduler. How to do this varies slightly between Windows versions, take a look here for some hints on configuring Windows Task Scheduler.